Collecting the faeces of an extremely strong, 120kg sea turtle in the open ocean is no simple task. But University of Queensland researchers have developed an ingenious solution, by dressing the turtles in stylish, customised swimsuits. A PhD student from UQ’s School of Biological Sciences, Owen Coffee, with the help of UQ researcher Carmen da Silva, is researching the diet of endangered sea turtles in the hope of locating their foraging areas to better protect the species. Mr Coffee said the swimsuits acted as a harness for “a giant nappy”. 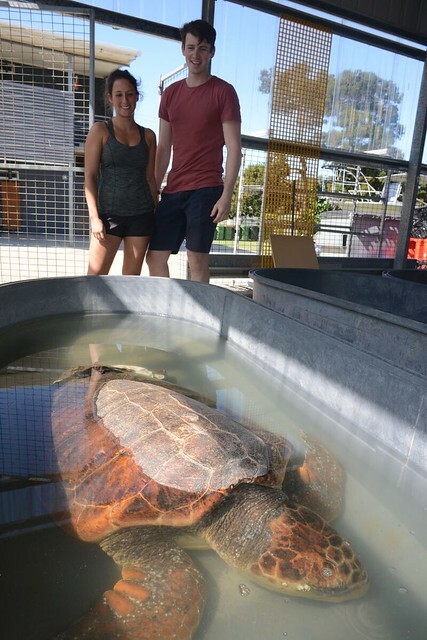 The researchers captured six loggerhead sea turtles and kept them in seawater tanks at UQ’s Moreton Bay Research Station until they defecated. “However, it was challenging to collect the entire faecal sample once it dispersed into the water,” Mr Coffee said. “So we developed a flexible funnel anchored to the shell, to fit over the turtle’s tail. While Mr Coffee was brainstorming the problem with UQ Moreton Bay Research Station staff, the station’s education coordinator, Dr Kathy Townsend, said researchers had previously developed soft, flexible harnesses when studying the vision of sea turtle hatchlings. “It was made out of swimsuit material and fitted snugly over the turtle’s shell,” Dr Townsend said. “After a few modifications, including Velcro-attachments for the ‘nappy’, we hoped we had the perfect solution to our unusual problem,” Dr Townsend said. “To our great surprise, it worked perfectly. After the samples were collected, the world’s best-dressed sea turtles had their swimsuits removed and were returned to Moreton Bay; leaving behind important scientific samples that will be used to further protect their species. Media: Casey Fung, c.fung@uq.edu.au, +617 3346 7887.